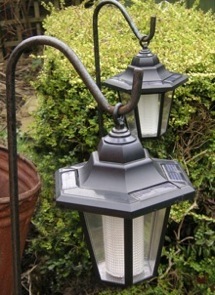 Solar Outdoor Lights range from beautiful garden lighting to solar safety lights. Outdoor Solar garden lighting options. Incorporating Solar Outdoor Lights into your yardscape, ups the liveability of your outdoor space. Solar garden lights increase Wow! factor while sensors in outdoor solar motion lights make your property safer for your family and visitors. Use Solar Lights to create dramatic results in your outdoor living space. Here are some solar garden lighting options currently available and how to get the best use of them. Outdoor Solar Lights ~ Solar garden lights come in an amazing array of styles and shapes. Many have tiny solar panels incorporated right into the design of the light. Simply place it in a sunny location where it'll capture sunlight during the day. A small battery stores the energy til the sun goes down then, voila, the light turns on by itself at night. Some types of outdoor solar lights have a solar panel that is separate from the light itself. The panel is placed in a sunny area and the light can be placed almost anywhere you want it. Choose this style for backlighting shrubbery (Place lights behind or inside plantings for a dramatic effect) because the light itself can be placed in a shady area (under the bush) as long as the panel is placed in the sun. Solar Powered Path Lights ~ Light the way to your door, a gazebo, the pond, the garage... wherever. Solar outdoor lights guide the way through your yard, clearly marking pathways and preventing damage... to your gardens and your guests. Solar Flood Lights ~ Flood lights are an excellent choice for casting light directly on to focal points and special garden features. Focus the light directly onto your shrubbery and statuary or uplight special features. Solar Powered Bricks ~ Yup... you can drive right over these puppies or build them into a wall. Solar bricks are the same size as regular building bricks making it easy to fit a few solar bricks into a project. They are weather proof, durable and batteries can be changed to ensure long term use. Solar Powered Motion Lights ~ For safety's sake use motion detector lights. Install motion lights in places where you only want light when it's needed. These intense lights turn on automatically when they detect motion in the immediate area. For safe nighttime passage around driveways, pools, outbuildings, stairways and in front of doorways you want bright illumination. One of our favorite things about motion lights is that while homeowners like them, intruders don't. Solar Powered Lamp Post ~ Charming and elegant, solar lamp posts stand sentinel on your property and cast a welcoming glow for your guests. Because they're solar powered it's easy to place them wherever you want. Solar Christmas Lights ~ Enjoy a beautiful Christmas light display without the scary electrical bill that follows conventional lighting displays. These solar outdoor lights will turn themselves on and off too. They're so beautiful and easy on the power bill that you just might want to leave some solar string lights in your garden all year long. Solar outdoor lights can transform a ho hum yard and garden into a breathtaking nightscape. And they're more than just beautiful. Strategically placed motion and pathway lights discourage intruders and make nighttime navigation around the yard safer.